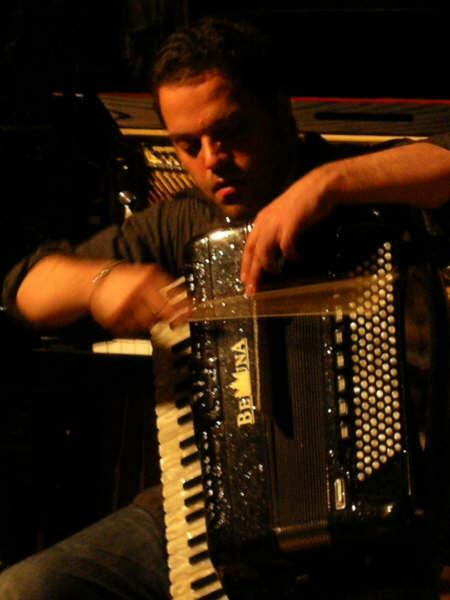 At the end of the 1980s, during his studies of music at the Scuola Popolare di Musica di Testaccio (Rome) and composition with Boris Porena, Luca Venitucci started taking part in the improvised music scene in Italy and Europe. Over the next ten years he met and played with many musicians, including: Mike Cooper, Peter Kowald, Otomo Yoshihide, Thomas Lehn, Axel Dorner, Tim Hodgkinson, John Butcher, Mario Schiano, Alessandro Bosetti, Annette Krebs, Michael Renkel, Alexander Caric, among others. In 1995 he co-founded the electro-acoustic improvising group OSSATURA, with Fabrizio Spera, Elio Martusciello and Maurizio Martusciello. This group tours widely and has participated in festivals around Europe and Canada. From 1996 to 2002 he was part of the ZEITKRATZER Ensemble, with whom he performed and recorded contemporary music compositions (by Cage, Glass, Stockhausen, LaMonte Young, James Tenney) and contributed to original music projects and collaborations with several experimental musicians and composers including: Christian Marclay, Butch Morris, Francisco Lopez, Carsten Nicolai, John Duncan, Manuel Gottsching, Keith Rowe, Masami Akita, Mario Bertoncini, Phill Niblock, Radu Malfatti, Terre Thaemlitz, Zbignew Karkowsky, Lee Ranaldo, Nicolas Collins. In 2001 together with Ulrich Krieger, he transcribed and arranged an ensemble version of Lou Reed’s Metal Machine Music, later performed by the Zeitkratzer ensemble with the composer at Maerzmusik Contemporary Music Festival in Berlin. His current projects and collaborations include: ARTURO (a cross-media collective performance group) MONDO RA (an Italian improvisers orchestra devoted to Sun Ra music), the DUO with saxophonist Edoardo Marraffa, the MOMO group (contemporary singer/songwriter) and OSSATURA (see above). Recently he has played in group ARDECORE with members of ZU and Geoff Farina from punk rock group Karate. He has participated in projects with: Luigi Cinque, Jon Rose, Boris Kovac, Giorgio Battistelli, Bruno Tommaso, Massimo Coen, and has worked with the actress Federica Santoro, the Travirovesce dance company, writers Jonathan Coe, Vito Riviello and the poet Lidia Riviello. His solo international level performances include the Zugenschlag festival in Podewil, Berlin and the 2002 Edition of the Literature festival in Rome.